Only 1 in 10 single South Koreans consider a wedding ceremony to be mandatory for married couples, a survey showed Monday, indicating a shift in perceptions compared with past years. In Korea, a couple can formalize their marriage by registering a declaration of marriage with the local authorities, with no need for a ceremony. 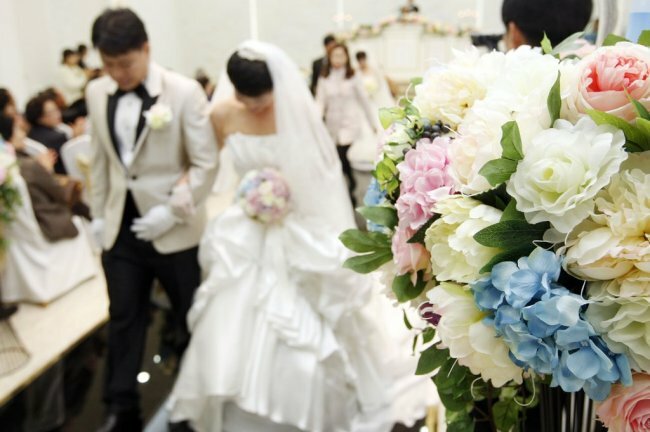 According to a survey conducted by the Korea Institute for Health and Social Affairs, out of 2,464 unmarried Koreans asked -- 1,140 men and 1,324 women between the ages of 20-44 -- those who replied that a wedding ceremony is a must stood at a mere 10 percent. “Overall, the ratio of (survey respondents) in favor of a wedding stands at about half the people surveyed. But the portion of those who replied that a wedding is a must drops to the 10 percentage range. This is attributable to the growing importance of one’s decision and judgment and less importance placed on formality in marriage,” said the institute. The ratio of single men “strongly” in support of a wedding ceremony tallied at 14.5 percent and those “generally” in support at 44.2 percent, the survey said. For single women, 10.8 percent answered that they strongly favored weddings, and 34.4 percent said they were generally in favor.